4 Hidden Café Gems That’s Simply Perfect For Your Instagram Feed And Your Tastebuds! I bet you 50 bucks they’re heading to a café. Whether it’s ice-cream or spaghetti, these independent joints never fail in expand their menu time and time again to accommodate various palates. Talk about improvisation right? It has been more than a few memorable years since the café craze landed right onto our Malaysian shore and today it’s showing little signs of slowing down. 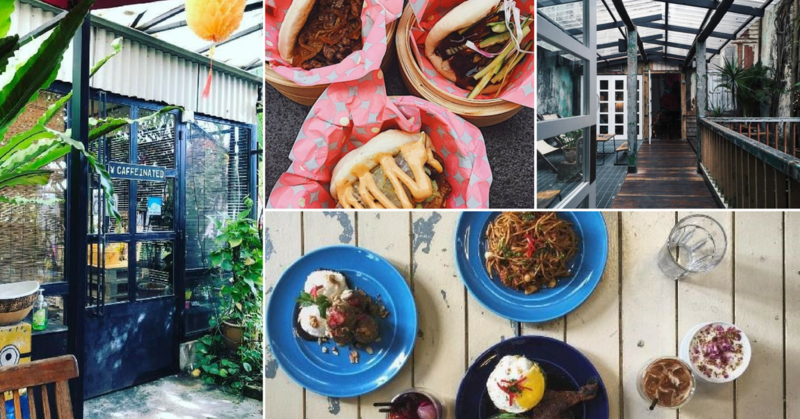 Whenever you’re craving for a change from your regular, these hidden café gems are bound to satiate your tummy (and Instagram!) fix. Whatchu waiting for? Hop into the car and kickstart your weekend to high gear with a satisfying brew! Tucked amidst the hustle and bustle of the famed tourist trap Petaling Street, Merchant Lane is indeed a celebratory mesh of both modern and traditional from its squeaky clean doorframes perfectly complementing the creaky rattan chairs in the interior. Gorgeous vintage decor appeases even the sorest eyes once entered, made even more authentic by its shady history of a brothel house (gasp!). Citing a strong Asian influence over its food offerings, expect innovative twists to classic Western cuisines such as ‘Italian Chow Mien’ and the famed ‘Hongkie Beef Stew’. Tagged with a reasonable RM20+ price for main courses, feast your eyes upon the outdoor patio that flaunts an old-world charm through rustic furniture and sprouting greeneries. A newfound gem nestled between Damansara Uptown’s famed eateries, many would have spotted this alien neon-pink sign at a discrete entrance located right next to Village Park but few were adventurous enough to venture further. The brainchild of a few master coffee connoisseurs in the local scene and celebrity blogger Jane Chuck, this innovative store boasts a unique menu curation consisting of freshly made gelato ice-cream, inventive steamed baos and of course, the coffee itself. If you’re up for some socializing over a steamy cup of joe, Random Food Store offers the perfect venue through their unique communal dining table (something like Hogwarts, how exciting!) that encourages for random chit chats with friendly strangers. Coffee, waffle and pastries – what could possibly go wrong? Escape the city bustles and take temporary refuge in this cosy cabin that houses a homely aesthetic once entered. Caffeinated Cabin sticks the classics with their impressively diverse menu that includes an all-day brunch and Western fusion main courses, perfect for dropping by anytime during the day. Flaunting a scenic outdoor deck worthy of your Instagram feed, breathe in the sweet summer’s breeze or opt for the cooling air-conditioned indoors with homely furniture pieces as a visual touch. True to its whimsical-sounding name, enter Foo Foo and you’ll immediately be greeted with a throwback vibe through the retro flip calendar décor and vintage wooden furnishings. Although everything from first impressions point towards its penchant for timeless aesthetics, their dessert menu proves the exact opposite. A breath of fresh air in the overly-saturated local dessert scene, Foo Foo pulls an innovative collection of traditional plated desserts. Finely tweaked by masterchefs to accommodate the Malaysian palate, you’ll surely be impressed by the unusual combination of ingredients to create an exciting culinary experience. Must-try: Strawberry Tart with Balsamic Vinegar Ice-Cream and Masala-Spiced Poached Pear with Chrysanthemum Ice-Cream. What are you waiting for? These food are not gonna eat themselves up!